You are here: Home / Asset Management / Is The U.S. Fed Running Out Of Ammunition To Ward Off Recession? Madam Secretary Yellen’s testimony to Congress on Wednesday lasted three whole hours, making it clear that the Federal Reserve’s actions are increasingly attracting political scrutiny. 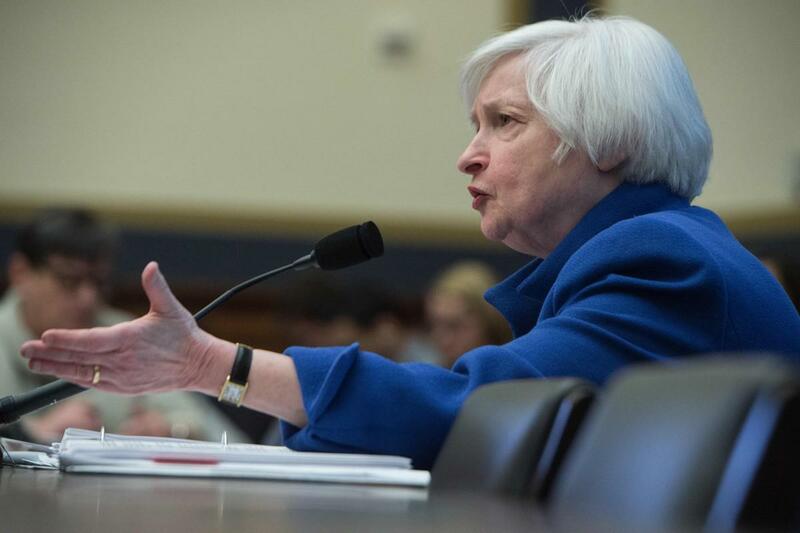 Indeed, Yellen’s role is more vital than ever, both for the US and global economy. Given that the deadlock in Washington means fiscal stimulus is unlikely, monetary policy remains the only feasible means to avoid the US economy dipping into recession. Simultaneously, foreign borrowing in dollars is at its historical maximum, making the global economy dependent on US monetary policy more than ever. One could argue that the US Central Bank is the Central Bank of the world economy. Thus Yellen needs to consider second and third order of consequences of her decisions, not only at home, but also abroad. Her goal is straight forward, to steer the US economy smoothly through the recovery and minimize global financial market volatility. To this end, she can either hit the brakes or try to hit the gas and her two tools are interest rates and Quantitative Easing. Lowering the Fed Funds Rate (the rate at which banks lend to each other overnight) cheapens cash which both boosts asset prices and increases the amount of credit flowing through the economy. Buying assets through QE increases liquidity and boosts assets. A boost to asset prices is a boost to household wealth, and in turn, spending. But her job is not that simple and her challenge is two fold: 1) gaining clarify on economic conditions and market turmoil and 2) ensuring that the actions she selects will be effective. As Yellen made clear in her testimony, fundamental economic data is mixed and it is not clear where markets and economic conditions are headed, nor what the interaction of the two will be. The most important question, though, is whether she has the ammo to the reverse a slowdown. 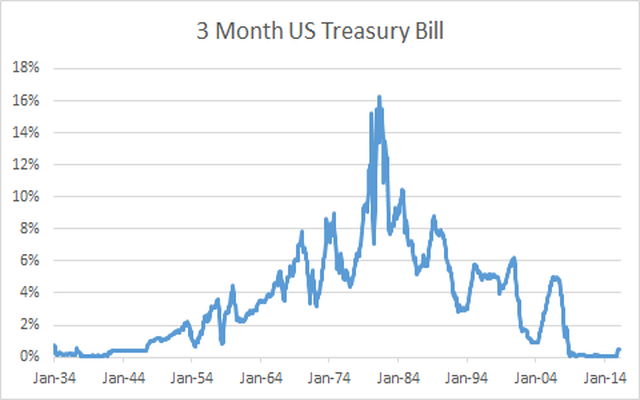 Interest rates are currently at secular lows, which means Yellen has less room to stimulate than practically in any period going back to 1934. You can see that the December tightening is nothing more than a blip on the historical chart and a reversal would be small relative to previous easings. Having rates at zero is not a problem so long as the economy is growing and the labor market is tightening. It is a problem when a shock occurs. Ms. Yellen’s second option is of course to reinstate quantitative easing. Such move would boost asset prices in the short term and reduce liquidity squeezes across the globe but it is unclear that that is a sustainable solution. Likely we will just face the same problem 12 months down the road. Additionally, as we can see in the case of Europe and Japan, each batch of QE is less effective than the last so it might require an unprecedented program to move the needle. This brings us to the shape of the yield curve. Not all situations of near-zero interest rates are created equal. The shape of the yield curve works both as an indicator of markets and economic conditions as well as an influencer of the same. It is particularly important in the context of near zero rates. Economists and professional investors can look at the yield curve for any country and tell you a good deal about what is going on. A steep yield curve is indicative of easier monetary policy that occurs at the beginning of the business cycle. Growth is strong, asset prices are performing and there is no immediate inflationary pressure because capacity is not that tight. The central bank is letting growth ride. An inverted yield curve, occurs at the end of the cycle where the central bank runs tight monetary policy to slow down the economy and ease inflationary pressure. Assets tend to underperform in this period. It is very rare to have a strictly inverted yield curve. Only 7% of the periods since 1970 have involved an inverted curve. This is because investors generally demand to be paid a higher interest rate on long term bonds than they do on short term bonds. In the last month we have dipped below the historical average. So what is the relationship of the yield curve shape and asset prices? Risky assets, both stocks and bond outperform during environments where the yield curve is steeper than its historical average. A risk-balanced portfolio of stocks and bonds has average monthly returns that are 60% higher when the yield curve is steeper than average versus when it is flatter than average (for example 1.6% average monthly versus 1%). Monthly equity returns are 37% higher in steep environments relative to less steep environments and for bonds it is 81%. In today’s context, the shape of the yield curve has more importance than ever because short term interest rates are near zero. 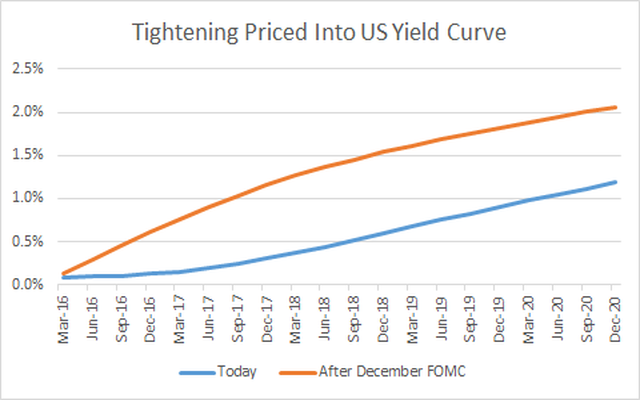 In previous interest rate cycles the Fed could always cut interest rates to create a steep yield curve, now there is very little room for this. For equities, this is very important because the yield curve is used to discount equity cash flows. When markets turn down and equities sell off, yields implicitly act as a cushion to PE ratios. But the more the yield curve flattens in a zero rate world, the less of a cushion there is for future shocks. Furthermore, portfolios that use bonds as a hedge to stocks will become unbalanced simply because yields will have less room to fall.